Now I went into this book completely, 100% blind. I refrained from reading even the synopsis to the story, let alone any reviews. I didn’t know exactly what to expect….but I can tell you that it wasn’t this. I’ve been a fan of Erin Watt since their inception. I believe that I’ve read just about everything that this writing duo has released. I especially loved When It’s Real…and let’s not even get started on their Royals series. 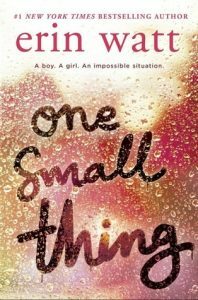 So, I was expecting something similar to these stories when I sat down to read One Small Thing. And boy was I surprised. This story had some unexpected twists to it. It’s not a light hearted subject either. The two main characters meet up and hook up one night at a high school party. Beth “Lizzie” is out of her element, hanging with kids that she doesn’t know. Attending a party at a house that she’s not familiar with. She’s trying to escape something…or is she trying to find something, or someone? She finds Chase “Charlie”. He’s the hot guy who catches her eye across the kitchen and she seeks him out. She figures that this is a one time thing, and that she will never have to see these kids again. That she can lose herself for the night; and she does. What she doesn’t expect is to walk into her Calculus class the first day of her senior year to find Chase there. What she doesn’t also expect is to find out that these 2 are permanently linked – no she’s not pregnant. But these 2 are irrevocably tied together due to things that happened in the past. Things that each is trying to accept and move on from. An interesting, twisted story. I loved it. It kept me on my toes. I was pleasantly surprised with the outcome of the story. I found my self rooting on Chase. I also found myself angry with Beth’s friends. As a whole, a brilliantly written story!